Mom was a little concerned the other day as she helped Izzy find a butterfly net to catch white-headed “bumblebees.” Izzy was back in a couple of minutes with a roaring buzz emanating from her closed, cupped hands. She deposited her captured quarry into her butterfly cage and there, for all practical purposes, was a large white-headed bumblebee buzzing loudly and bouncing off the netted walls of the cage. Actually it wasn’t a bumblebee Izzy had caught but an eastern carpenter bee, Xylocopa virginica. I was to blame for the misnomer. A few springs ago I had impressed my four or five year old daughter with my daring by snatching a “bumblebee” from a flower with my bare hands. Then I told her how, when I was a little boy growing up in Mer Rouge, Lou., we used to wander the lawns around town catching “white-headed bumblebees” and tying sewing thread around their middle to create bumblebee kites. 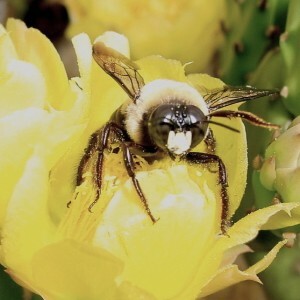 None of us knew what a carpenter bee was but we all knew that the bumblebees with the white to yellowish-white square patch on the head could not sting and were fair game. Humans seem to learn early, perhaps by osmosis in the womb, that if something buzzes and it’s black and yellow – it’s a bumblebee and it will sting you. The white patch on the head or face of the male eastern carpenter bee is a quick give away. It’s prominent and easy to see and even eight-year-olds can remember that if it has a white head, it doesn’t sting. The female eastern carpenter bee does not have a white head and while it is not as aggressive as a bumblebee it can sting. Carpenter bees (even the females) and bumblebees can easily be distinguished by coloration in the field once we get past that “black and yellow sting” thing. The abdomen (remember insects have a head, thorax and abdomen) of the carpenter bee is bare and black. The abdomen of a bumblebee is hairy and yellow. Carpenter bees are not social nesters like bumblebees and honeybees. The female carpenter bee makes its nest by tunneling into wood. Before the urbanization of America, this meant dry standing wood. Conifers seemed to be preferred. Today carpenter bees are sometimes thought of as pests because they will bore into homes and other structures. The damage is usually confined to a small area, as carpenter bees prefer to lay their eggs in the same hole or tunnel they were born in. Carpenter bees, especially the females are useful pollinators and gardeners and orchard keepers sometimes provide softy dry wood for nesting. The male is not as useful as a pollinator because it will sometimes “rob” flowers by chewing through the corolla rather than crawling in, thus bypassing the gathering and dispersing of pollen. Males are content to spend most of their time hovering around and guarding their territory. While they can’t sting they are quite curious and will quickly come to investigate any intruder, including the two-legged kind. Little do they know that this plays right into Izzy’s hands or net.